Vitrified floor tiles are compacted, high-gloss tiles that are highly durable and easy to maintain. When you want to clean these floor tiles, the process requires little work as the gloss finish provides a protective barrier that prevents liquid and stains from penetrating the tile. Instead of using a high-priced commercial tile cleaner, make your own cleaning solution. Clean vitrified floor tiles with a homemade cleaner. Sweep the floors at least once per week to collect dust and other loose elements that may cause damage to the flooring. Run a mop under hot water, wring it out and wipe it across the vitrified tiles. Let the flooring air-dry and keep all foot traffic off the floor until dry to prevent footprints from drying onto your clean floor. 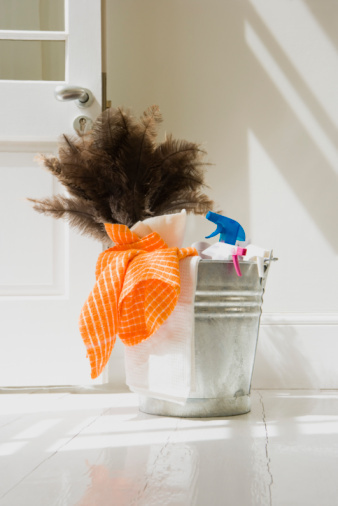 Mix 1 cup white vinegar and 1 gallon hot water in a bucket for a more thorough cleaning. Again, dip the mop into the solution, wring it out and wipe it over the flooring. Allow the floor to air-dry and keep foot traffic off the floor as it dries.